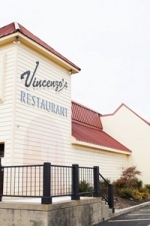 There are plenty of dining options in Sharonville, ranging from fast food to casual and fine dining. One really unique venue, only open during the warm season, is the Root Beer Stand, which, true to its name, serves delicious home made root beer as well as burgers, hot dogs and fries. 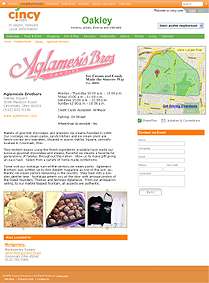 Other casual favorites are Angilo's Pizza and the family friendly Chuck E. Cheese. 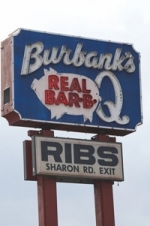 For excellent barbeque, fried green tomatoes and other Southern treats, one can't do much better than Burbank's Real Bar-B-Q. El Rancho Grande features great traditional Mexican food, while Sabor Peruano serves Peruvian delights and Athenian specializes in Greek fare. When in the mood for something slightly exotic, there are several Indian and other Asian eateries in the area, including New Krishna, Aangan Restaurant and Chinese Imperial Inn. More upscale dining can be found at La Petite France (specializing in classic French cuisine) and Vincenzo's Italian Restaurant. When it's time for dessert, Alreddy Coffee and Café provides espressos and teas. Sharonville's nightlife rocks with a couple of great live music venues. Burbank's Real Bar-B-Q features a Blues jam session with Sonny Moorman every Thursday night, as well as some of the city's best Blues bands on Friday and Saturday nights. Rhino's Bar & Grill is an even larger live music club, featuring bigger bands in all genres, from Salsa to R&B to Rock. There are also a few neighborhood bars worth checking out. Blue Goose Sports Café is a great place to catch a Sunday afternoon football game, and Al's Bar does pool and karaoke. For more serious pool enthusiasts, there's BK Billiards, and for a stiff or more formal drink, the Sheraton Cincinnati North Hotel features a nice lounge. If popcorn and a flick are more the mood, the latest blockbusters are always showing at Springdale Cinema.